Dubai, the city of dreams, looks dreamier when you take the dhow cruise in Dubai. The cruise lets you see stunning views of night-time Dubai in the most amazing settings. Dhows were traditional fishing boats that were used when Dubai was just a simple coastal city. These dhow boats have been converted into cruise ships, so they can be used for dinner cruises. The dhow cruise is quite a popular activity, as it is romantic, has lots of entertainment and offers a delicious buffet dinner. 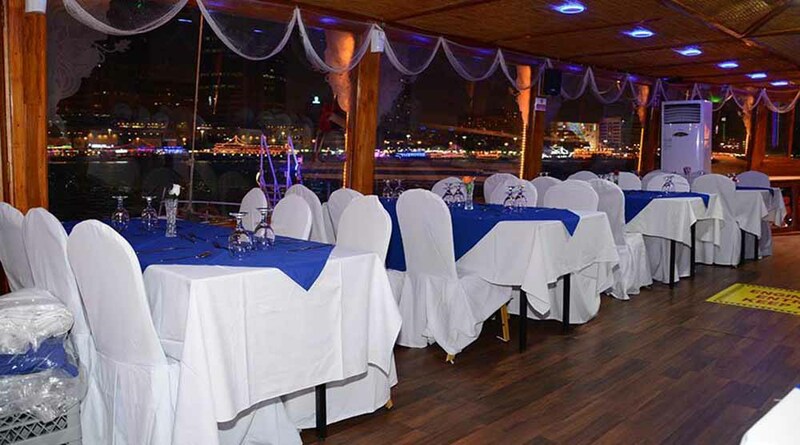 It is a great way to spend a memorable evening on Dubai Creek or the Dubai Marina. The dhow cruise is a fun activity and has 5 highlights to look forward to. Let’s have a close look at what you should expect. The cruise starts from the beautiful Dubai Creek or Dubai Marina. You are taken aboard the cruise where you are warmly greeted by the polite staff. Stroll around to have a close look at the beautiful ship. The staff will make you feel at home. Then, you will be seated at your beautiful table decorated with flowers. To make it all even more beautiful, you are served a delicious welcome drink that will arouse your appetite. From the moment you step on to the cruise until you leave it, you are treated to entertaining music that will put you in a good mood. 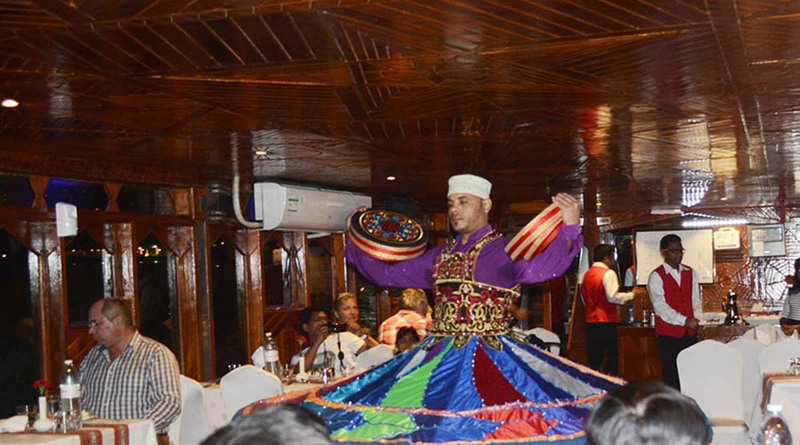 During the 2 hour cruise, you are also treated to a dance performance by the Tanura dancers. The dancers are required to spin around in a circle in a hypnotic manner, mimicking the spinning of the Earth and other planets. This wonderful dance form is ancient, entertaining and mesmerizing. One of the highlights of the cruise is the food. Firstly, you are served with a delicious welcome drink once you are onboard. The drink is supposed to ignite your taste buds and make you feel hungry. Soon, it is time for dinner, which is a lavish spread of Emirati and other popular cuisines. The buffet spread contains tasty and fresh salads, scrumptious starters, delicious main course, and melt-in-your-mouth dessert dishes. Emirati cuisine is known for being delicious and spicy, and you will be feasting on dishes prepared by 5-star quality chefs. The dhow cruise in Dubai can either be on the Dubai Creek or Dubai Marina. The creek is considered to be the lifeline of the city. It is beautiful and has been used for commuting for many ages. During the cruise, you get to see some exclusive views of Dubai city. Dubai looks absolutely beautiful when it is lit in the night. This is a city that rarely sleeps, so even in the night; there are a lot of lights and buzzing. From the creek, you can see the old part of Dubai, which is not very developed, and the new part which is developed, and full glitz and glamour. The contrast makes for a great view. 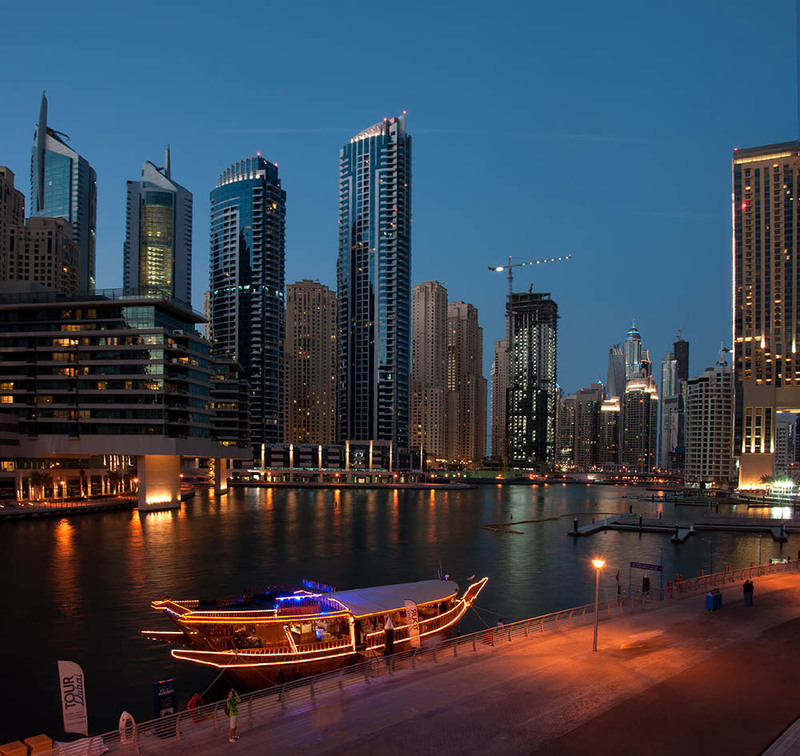 Moreover, if you choose to go on a dhow cruise dinner at Dubai Marina, you would be able to see the sights of one of the most luxurious neighborhoods of the city. On the other hand, whichever location you choose, you would be able to see a starry, unobstructed sky from the top deck. Life in Dubai is fast-paced. There’s so much happening throughout the day. Even the tourist attractions are packed with speed and adventure. However, the dhow cruise does the opposite. It gives you a chance to calm down and relax. 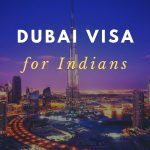 It gives you the opportunity to escape the maddening crowds, heat and the crazy pace of life in Dubai. Out on the water, with the cool sea breeze blowing about, you can feel all your worries melt away, as the only thing you feel is that moment of peace, quiet and tranquillity. The dhow cruise Dubai is a great way to see the softer, more romantic side of Dubai. 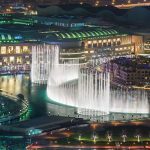 There’s so much to do in Dubai that it can get overwhelming. 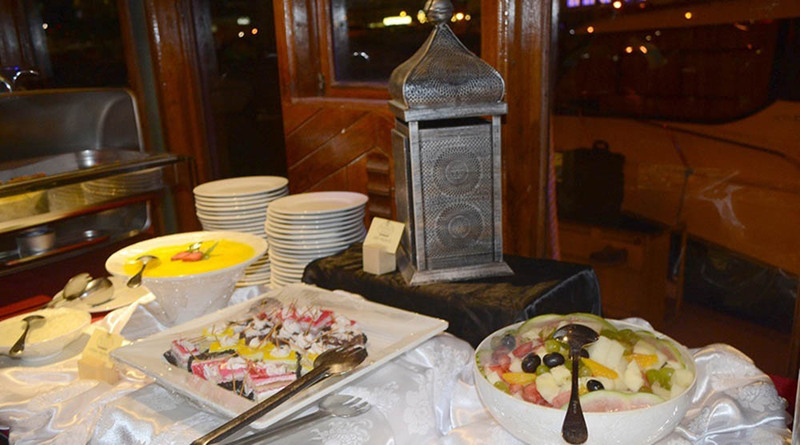 But at the dhow cruise, relaxation is the only agenda, along with good food and entertainment. You are guaranteed to make some amazing memories on the cruise. So, book some relaxing time on the Dubai dhow cruise and see the city in a new way.